We live in tumultuous times. Once again, this week's news was filled with violence and controversy. I long for peace and quiet in the midst of this world's chaos. 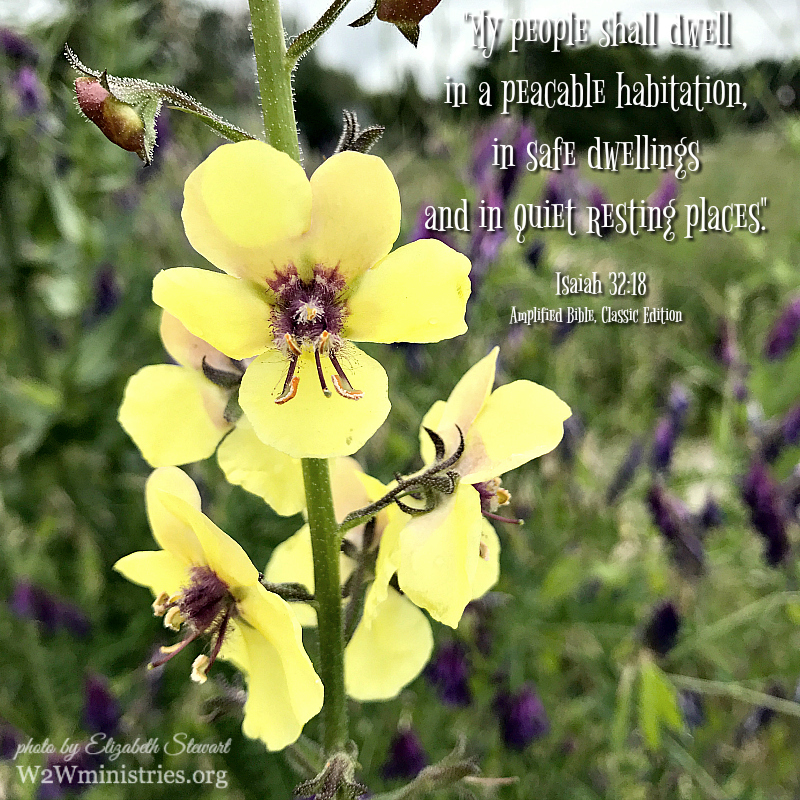 In Isaiah 32:18 we read that God's people can dwell in peace, safety and quiet. Perhaps there are some things that we can do to cooperate with God in making this happen. 1) Ask the Prince of Peace to dwell in you and in your home and family. Jesus is the Prince of Peace. Invite Him into every area of your life, home and family. Give Him permission to show you anything in you, your home and your family that is a peace robber. There are many things that can steal your peace. Unforgiveness, offenses, worry, anxiety, overcrowded schedules, chaotic surroundings...I could go on and on. The good news is that God is willing to show us the things that are keeping us from living in peace if we will ask Him to and then listen to Him. 2) Feed on the Word more than you feed on the world. I'm a news junkie. I want to know what is happening in our world. But if I'm feeding on the news more than I am on God's Word, no wonder I'm feeling stressed and anxious! God's Word is the plumbline of truth in this world that has lost its way. We've got to keep our mind and heart aligned with truth or we'll lose our way as well. God's ways, the way of wisdom, is a path of peace it tells us in Proverbs 3:17. Isaiah 26:3 promises us perfect peace when we keep our mind set on God. This week my lower back went out which limited my ability to get outside and walk. After a few days I noticed myself feeling anxious. Exercise is a great stress reliever. My walks are also times when I listen to worship music and have some good heart to heart talks with God. Both the exercise and the prayer time help me to stay at peace. Extended breaks are also necessary at times. Quiet times away from stress, the demands of everyday life, and the noise of social media are good for us. If you can't go away for a weekend or a vacation, take a couple of hours for a mini getaway. Find a beautiful place somewhere close to home, such as a local park, river or lake. Take your Bible and journal and soak in the beauty of God's creation and spend some quiet moments with Him. Let go of what is causing you stress and ask God to carry it. Exchange it for His peace. I think God wants our lives and homes to be filled with peace, not just for our benefit, but also because of the witness that it is to others. Peace and quiet is a rare commodity in our chaotic world. Others notice a person whose life is filled with peace. People want to linger in a home filled with peace. I thank You that you sent Jesus, my Prince of Peace, so that I can have peace with You. I thank you that I can walk in love and unity with You because of the righteousness of Jesus that I have been given in exchange for my sin. If there is anything in my thoughts, words or deeds or in the affections and desires of my heart that is robbing me of the peace that You want me to have, please show me what it is. Bring everything within me to into obedience to You and Your ways so that Your peace can rule my heart, mind and life. Father, I want my home and family to be filled with Your peace. Fill our home with Your peace and presence. Let it be palpable to all who enter our home. I pray for every family member to come into alignment with You and Your ways so they, too, can walk and live in peace. I ask this in the name of Your Son, Jesus. Amen.